2007-02-04. Good. Ships with Tracking Number! INTERNATIONAL WORLDWIDE Shipping available. May not contain Access Codes or Supplements. May be ex-library. Shipping & Handling by region. Buy with confidence, excellent customer service! New York: Pantheon Books. Hardcover. 1969. 8vos 432/523pp . Fine in Very Good DJ. 2 volume set . Pantheon Publishing -, 1968. Hardcover/pub.1968/Fair condition/432 pages - History of the Cold War from the October Revolution to the Korean War, 1917-1950. [AR528407]. Hard Cover. Good. Vintage Books. Used - Good. Ships from the UK. Former Library book. Shows some signs of wear, and may have some markings on the inside. 100% Money Back Guarantee. Your purchase also supports literacy charities. Pantheon Books., New York, 1969. Hardcover. Very Good. Hardcover and dust jacket in Mylar. Light wear. Clean, unmarked pages. Ships daily. Pantheon Books, New York: 1969. Hardcover with dustjacket. Reading copy. Dustjacket has water stains. 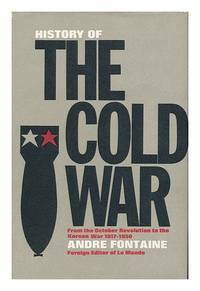 The second volume of Andre Fontaine's History of the Cold War takes us from the beginning of the Korean War to the present day. Includes an Index. Pantheon Books, New York: 1968. Hardcover with dustjacket. Good condition. Dustjacket has water stains. A complete history of the Cold War in its early phases. Includes an Index. New York: Vintage, 1970. Softcover. Good. Good in wrappers, a paperback. Translated from the French by Renaud Bruce. Pages brown, clean text. Shelf rubbing to cover. A couple small tears on top edges of cover. Wrinkles on spine. Please Note: This book has been transferred to Between the Covers from another database and might not be described to our usual standards. Please inquire for more detailed condition information. New York: Vintage, 1970. Softcover. Very Good. Very good in wrappers. Pages browned. Cover rubbed with sticker. Please Note: This book has been transferred to Between the Covers from another database and might not be described to our usual standards. Please inquire for more detailed condition information. New York: Vintage, 1970. Softcover. Good. First edition. Good in wrappers, a paperback. First Vintage edition. Pages brown, clean text. Cover shelf rubbed and light brown. Corners rubbed. Please Note: This book has been transferred to Between the Covers from another database and might not be described to our usual standards. Please inquire for more detailed condition information. New York: Random, 1968. Hardcover. Very Good/Very Good. First am. Very good in very good dustwrapper. Small tears and rubbings on dustwrapper. Please Note: This book has been transferred to Between the Covers from another database and might not be described to our usual standards. Please inquire for more detailed condition information. New York: Vintage, 1970. Softcover. Good. Good in wrappers, a paperback. Ink underlining. Pages browned. Light water stain on top edges of pages near seam. Corners flared. Chipping to top edges of cover. Shelf rubbing to cover. Wrinkles on spine. Please Note: This book has been transferred to Between the Covers from another database and might not be described to our usual standards. Please inquire for more detailed condition information. Pantheon Books. Hardcover. B0007DEWFE the dust jacket is torn and worn . Fair. Random. Hardcover. B000JCV79C . Good. Mar 1970 paperback Vintage Books edition. Spine creased and tilted, price label and light soil/tanning on white cover, two lines marked out on copyright page, pages tanned, light underlining, binding tight . For NY state residents I am required to add 8.875% sales tax. Pantheon Books., New York. Used - Very Good. Very Good condition. Good dust jacket. History of the Cold War: From the October Revolution to the Korean War, 1917-1950. Fontaine, Andre. Translated by D.D. Paige. New York: Pantheon Books. ex-lib, ow VG/VG- in Mylar.. 1968. Condition: ex-lib, ow VG/VG- in Mylar. Very Good. Former library copy, has library associated stamps/stickers. Different cover art than shown, same exact book. Very good used condition, little to no signs of wear, little to no signs of use. Ships fast & secure, expedited available! Secker & Warburg, 1968. 1st UK edition.. Hardback. Cloth, dj, VG/VG. xiv+432pp, 7 b/w maps, index, nearfine copy in a slightly rubbed & bumped dustjacket that has a slightly grubby rear panel. Good Single volume account of the decline in relations between the Communist East & Capitalist West. NY: Pantheon. NF. 1969. 1st American Edition. Hardcover. Stated first American edition. A near fine copy in a very good dust ja cket. The book has a slight spine lean. Rubs to the jacket's spine tip s and corners. Mild dust soiling to its spine and panels. .
New York: Pantheon Books, 1969. First American Edition. Clean pages with no markings except the normal library markings and attachments. The dust jacket is enclosed in a clear plastic cover and is taped to the book. . First Edition. Cloth. Good/Good. 8vo - over 7¾" - 9¾" tall. Ex-Library. New York: Pantheon Books. 1969. First American Edition. Hardcover. Small 4to 9" - 11" tall; 523 pages . New York: Pantheon Books, 1968. First American Edition. Clean pages with no markings except the normal library markings and attachments. The dust jacket is enclosed in a clear plastic cover and is taped to the book. . First Edition. Cloth. Good/Good. 8vo - over 7¾" - 9¾" tall. Ex-Library. Vintage. Used - Good. Good condition. Writing inside. Volume 2. Vintage. Used - Acceptable. Acceptable condition. Reading copy only. Cover tearing along spine. Writing inside. Vintage. Used - Good. Good condition. Volume 1. Pantheon Books. Used - Very Good. Very Good condition. Good dust jacket. Vintage Books, 1969. The insides of both covers and page edges are "tanned" at the edges. . Trade Paperback. Good. Martin Secker & Warburg Ltd. Hardcover. POOR. Noticeably used book. Heavy wear to cover. Pages contain marginal notes, underlining, and or highlighting. Possible ex library copy, with all the markings/stickers of that library. Accessories such as CD, codes, toys, and dust jackets may not be included. Pantheon Books. Hardcover. B00261N2OM Good Condition. Five star seller - Buy with confidence! . Good. Vintage Books. Paperback. POOR. Noticeably used book. Heavy wear to cover. Pages contain marginal notes, underlining, and or highlighting. Possible ex library copy, with all the markings/stickers of that library. Accessories such as CD, codes, toys, and dust jackets may not be included.